7. Rainfall data (inches or mm):1-hour, 24-hour,one week,one month and total since last reset. 15. 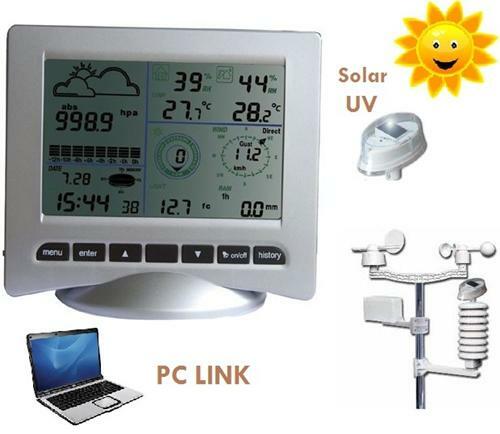 Indoor and outdoor temperature display in degrees Fahreheit or Celsius. 16. Indoor and outdoor humidity display in degrees Fahreheit or Celsius. I have had many years use of this great weather station. The Solar Power/UV/Lux sensor on mine has now stopped working. i would like to know where i can get a new part for this weather station, everything else works great still. on 5/29/2013 Now working properly. Had this on the roof about a month. Only issue I can find is the software needs updating a bit to make it easier to reset things and a fine tune.